Hello my children. It is I, the Scion of Curiosity. I mean Caliginosity. This week, I shall fill your puny little brains with knowledge about how to defend yourself. Because as a Goth, or Child of the Night, as I prefer to call it, we face many daily ordeals. 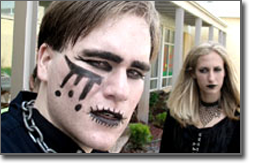 If you are truly a Goth, you know what I speak of. That is correct, my pupils -- those silly people who don't understand lifestyles that are not their own and so resort to using labels to categorize everything they don't like. I speak of course, of Preps, Jocks and Princesses. These groups may appear different, but they are more similar than different. But oh, so different from me. That is, they are not similar. Upon toiling our daily toils, we are faced quite often in the hallways of our respective schools with these individuals, who treat everyone as inferior to them. Just because we don't act the way they do, dress the way they do, or listen to the same music, they feel they have the right to call us names, label us, and hate us indiscriminately. I hate them all. Indiscriminately. We must protect ourselves! Not physically, of course. Violence is something we shant resort to, unless of course a proper human sacrifice is prepared. I've done a few, and they can be a real hassle, so you're better off just mouthing off. Yes! Exercising your vexatious vocabulary will stump your prey, leaving them an ignorant pile of goo the better to urinate upon. Speaking to them is not difficult. Practice at home with a thesaurus and a dictionary in front of the mirror. Letters count here, so find the maximum adventitious denominator of letters possible to express yourself. Smart words are important as well, so if you stumble across one that you are not 100% sure about the meaning of, it's probably a good one to throw out there. This makes you sound smart. "Do you lock your windows at night"
"I'd watch out if I was you"
"My dad has a gun"
My final bit of training involves your appearance. Do not cower in fear in the face of opposition. Instead, master the Glare. It appears simple when an expert, such as myself, performs it, but it is actually a skill that must be honed properly. You can not simply lower your eyebrows and make a frown. You must put every ounce of hatred into your mind and try to use it to stop their heart from pumping. Then you lower your eyebrows and make a frown. It helps if you have some of those cool, colored contacts. Those are real neat. Goth Gary is the Lord and Master of the Dark Realm, as well as three rooms in his parents' house. He could easily destroy you if he wanted.